Sanoxy USB 2.0 to 2.5" 3.5" IDE SATA HDD Hard Drive Converter Adapter Cable + AC Power Adapter, Supports SATA Hard Disk / ATA/ATAPI CD-ROM/R/RW DVD-ROM (based on ATAPI spec.) 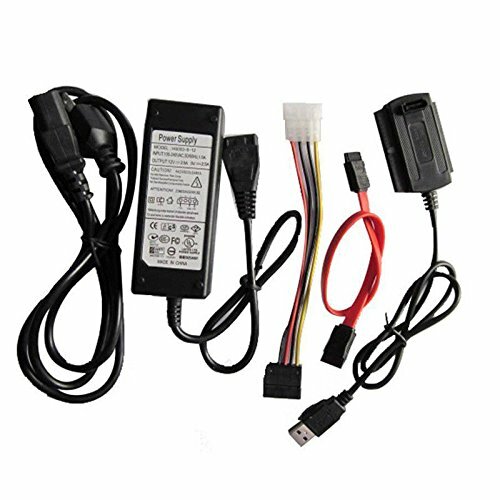 External power adapter included, for power up the 5V/12V IDE/ATAPI devices usage. Use your 2.5" / 3.5" IDE hard drive or SATA hard disc as an external hard drive. Connect your SATA / IDE device to your computer through a USB port. 480 MB/s high speed transfer rate (USB 2.0 specification), limit depend on the IDE device/SATA device and the driver. Connect to the IDE device using USB interface and SATA device too. USB 2.0 standard, 480M bps full speed.